Welcome to San An Super-Bay! 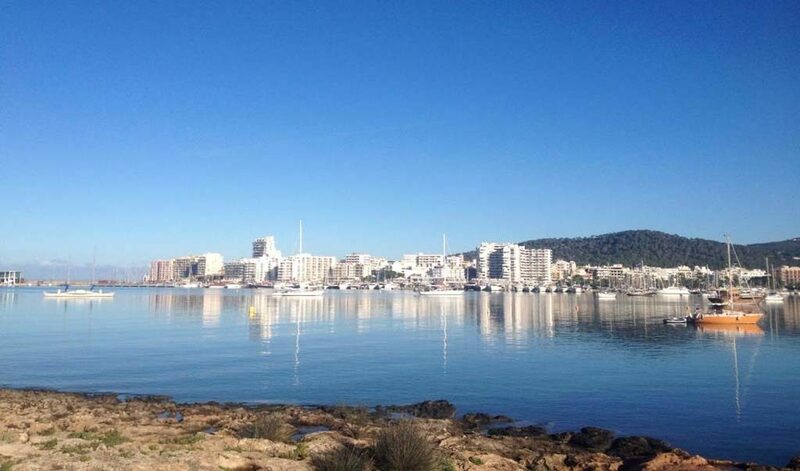 A 20 million euro budget has been agreed to construct a coastline paseo (promenade) in the Bay of San Antonio. 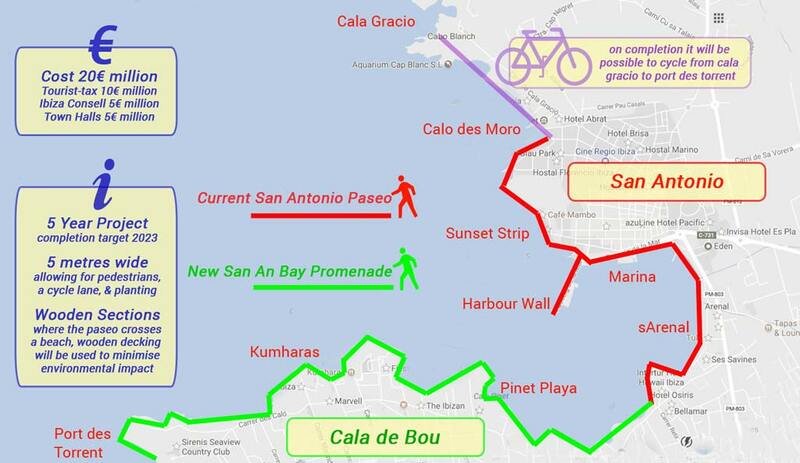 The new paseo will run the entire length of the bay from Port des Torrent to join up with the existing paseo in San Antonio, and thereby create a new connected San Antonio Super-Bay. The project will take 5 years to complete, and when finished it will be possible to walk/cycle on the coastline paseo all the way from Cala Gracio north of San Antonio around to Port des Torrent. The 20 million euro budget also allows for improvements along the passage of the paseo including jetties and pumping stations. The project is the first major public works to use funds raised from the recently introduced eco/tourist tax, which will pay half of the total cost, 10 million euros. The Consell de Ibiza will then pay 5 million euros, with the remaining 5 million being paid by the municipalities in ratio of the amount of construction in their own borough. In effect this will leave the vast majority of that 5 million with San Jose. The new paseo will connect with the existing San Antonio paseo that currently terminates near punta des moli windmill. This will leave a few hundred metres of the new paseo to be built inside the municipality of San Antonio, with the rest which forms the vast majority, inside San Jose. The new paseo will be 5 metres wide, allowing space for pedestrians, a dedicated cycle lane, and planting/installations. Where the new paseo has to traverse a beach, the construction will be in timber, in order to minimise any negative environmental impact. The project was announced jointly by the mayor of Sant Josep, Josep Marí Ribas Agustinet, and the first deputy mayor of Sant Antoni, Pablo Valdés. Marí Ribas said that the proposal “meets all the requirements of the type of project that should be presented to be financed with the proceeds of the ecotax” adding that the project is “environmentally sustainable”, though we have no idea what the last comment actually means. Mayor Valdés said there is a “unanimity and consensus that areas of the bay have an aspect of degradation”, and that the project would “wash the face” of Cala de Bou. Wow. What a week for news in San Jose. This announcement of the paseo in San An bay, is without question the biggest news of the year for Cala de Bou. I feel confident it may come to be seen as news of the decade, and my personal view is that it affords a lifeline for an area of the island that has not done well in recent times. Noticeable by their absence in yesterday´s communication re beach clubs, Cala de Bou has been left behind Ibiza´s changing face. It is one of the biggest concentrations of tourist beds on the island, and has a sizeable resident community – very possibly the biggest in San Jose, though i have no figures to back that up. Many living and working in the area view themselves as the poor relations of the municipality. Considered by the outside world as part of San Antonio, some locals feel their own San Jose town hall is content to consider them a San An suburb, and leave the people looking to their next door municipality for the resources that would be considered essential if San Antonio were not close by. A post office, police station, that kind of thing. The area is also blighted by the abandoned hotels that are a blot of the landscape and effectively cut the bay in two, creating a deadzone that tourists do not tend to traverse. Add to this a one way system in a much criticised plan of excellence which includes busses that take its own tourists out of the area without them even seeing what the rest of their own neighbourhood has to offer. The area has/had a disproportionate ratio of all inclusives, meaning the money was never coming outside the hotel grounds. The list goes on. Despite these pressures that are to large extent outside of its control. Cala de Bou also has to look to itself in why the area has declined. Mayor Valdés said there is a “unanimity and consensus that areas of the bay have an aspect of degradation”. A bit harsh? Not to my mind, I´d go further. Recently there have been exciting new developments such as the Pinet Playa Ibiza Rocks hotel, Axel Beach and the Beach Star, all of which bring a new dynamic to the bay. But walk its length of a night and you are still left with a feeling of being stuck in a 1990s seasonal groundhog day. I do walk its length occasionally, for strictly research purposes you understand, and though there are exceptions doing very well, the majority view is of year on year decline. To my mind it is the measurement of that decline against the halcyon heyday of package holidays and “a pint to a peseta” exchange rate that is of greatest concern. Those days are gone and they are not coming back. Some of the less forward-thinking businesses will understandably resist the new paseo as a change that is likely to take a lot of the already dwindling footfall away from their door. I do not know if there is comfort or reassurance available to give them. The bay needs rejuvenation and there may be casualties, but I am sure the majority will see the development as the positive it is. The new paseo will be a brilliant tool to break free of the rut. Firstly it will improve the area hugely in its own right. When is a town ever better without a promenade than with? It will give a whole new dimension and outlook for the people of the bay. But also its connection with the San Antonio paseo, itself a relatively new and very successful example of the benefits a paseo brings. The uninterrupted coastline promenade will create a San Antonio Super-Bay with literally miles of leisure and recreation accessible by people in both directions. San Antonio stands to benefit, Cala de Bou will certainly benefit. It is a tough market out there and a San An Super-Bay with its coastal artery of a modern and well managed paseo, with beautiful views and stunning sunsets, sounds a very cool place to be.